Since the NASA/ESA Hubble Space Telescope was launched, its goal has always been to study not only distant astronomical objects, but also the planets within our Solar System. Hubble's high-resolution images of our planetary neighbours can only be surpassed by pictures taken from spacecraft that actually visit these bodies. However, Hubble has one advantage over space probes: it can look at these objects periodically and observe them over much longer periods than any passing probe could. 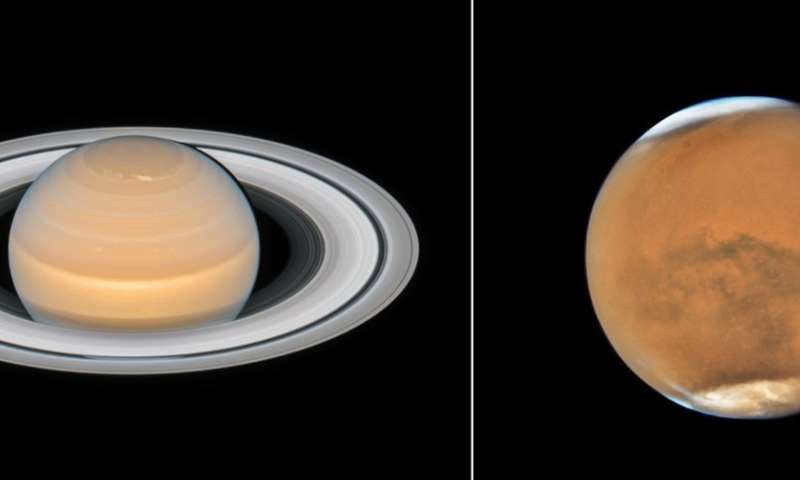 In the last months the planets Mars and Saturn have each been in opposition to Earth—Saturn on 27 June and Mars on 27 July. An opposition occurs when the Sun, Earth and an outer planet are lined up, with Earth sitting in between the Sun and the outer planet. During an opposition, a planet is fully lit by the Sun as seen from Earth, and it also marks the time when the planet is closest to Earth, allowing astronomers to see features on the planet's surface in greater detail. A month before Saturn's opposition—on 6 June—Hubble was used to observe the ringed planet. At this time Saturn was approximately 1.4 billion kilometres from Earth. The taken images show Saturn's magnificent ring system near its maximum tilt toward Earth, allowing a spectacular view of the rings and the gaps between them. Though all of the gas giants boast rings, Saturn's are the largest and most spectacular, stretching out to eight times the radius of the planet. Alongside a beautiful view of the ring system, Hubble's new image reveals a hexagonal pattern around the north pole—a stable and persistent wind feature discovered during the flyby of the Voyager 1 space probe in 1981. To the south of this feature a string of bright clouds is visible: remnants of a disintegrating storm. While observing the planet Hubble also managed to capture images of six of Saturn's 62 currently known moons: Dione, Enceladus, Tethys, Janus, Epimetheus, and Mimas. Scientists hypothesise that a small, wayward moon like one of these disintegrated 200 million years ago to form Saturn's ring system. Hubble shot the second portrait, of the planet Mars, on 18 July, just 13 days before Mars reached its closest approach to Earth. This year Mars will get as close as 57.6 million kilometres from Earth. This makes it the closest approach since 2003, when the red planet made its way closer to us than at any other time in almost 60 000 years. While previous images showed detailed surface features of the planet, this new image is dominated by a gigantic sandstorm enshrouding the entire planet. Still visible are the white polar caps, Terra Meridiani, the Schiaparelli Crater, and Hellas Basin—but all of these features are slightly blurred by the dust in the atmosphere.